John Martin has opened the Hot Wheels™ Car Care Products Porsche 911 GT3-R’s 2018 Australian GT Championship campaign with a fifth placing at today’s first race at the Formula 1 Rolex Australian Grand Prix in Melbourne. 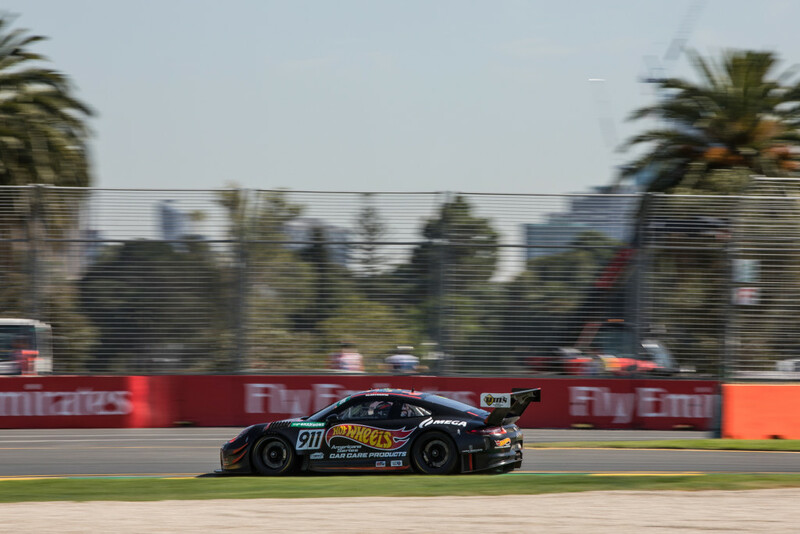 With no practice session to dial in a setup – drivers were straight into qualifying – with Martin approaching just the second session of the weekend at Albert Park this morning and Liam Talbot the other Australian GT qualifying session this afternoon. Martin’s qualifying was halted with a red flag at the time he was about to start his fast lap run. With the minimal time available and one flying lap achievable – he got caught in traffic. Similarly, when Talbot was against the clock, he was unable to get a clear lap in with the huge field of Australian GT Championship competitors turning out for the F1 event this year. Compounding the frustration, both were battling significant oversteer. Martin qualified for the opening race in fifth placing and Talbot in 10th. In the ‘Pro’ 11-lap race held at twilight, Martin was flying the flag for Hot Wheels™ Car Care Products for the first time in Australian GT against the likes of 2005 Formula 1 Australian Grand Prix winner, Giancarlo Fisichella and three-times Le Mans 24 Hour winner, Marcel Fassler. The race was largely uneventful for Martin, however the team are making some changes overnight ahead of Talbot’s race at 10:45am tomorrow morning to try and combat the oversteer both drivers were experiencing today. Since launching earlier this week, the Walkinshaw GT3-prepared Hot Wheels™ Car Care Products Porsche has turned heads right around the world. Hot Wheels™ Car Care Products will be available next month from www.hotwheelscarcare.com.au. They are produced in Australia, under license from Mattel using the proven Americana Pro formula. Tomorrow’s race will begin at 10:45am with Talbot at the wheel before a further race on Saturday and Sunday. Liam Talbot Racing is backed by Hot Wheels™ Car Care Products and MEGA Fuels along with new supporters, Hardy Brothers Jewellers and continued support from WashIt Australia Mobile Truck Wash and Urban Maintenance Systems. “Today’s been an interesting one for both John and I,” said Talbot. “We were both just hampered by traffic in qualifying and battling oversteer, our positions weren’t indicative of where we feel we should be. “We’re working overnight to put some huge changes into the Hot Wheels™ Car Care Products Porsche so we can try to get back amongst it. “Both John and I were hampered by traffic during our runs so couldn’t really get a clear, fast lap in. “John had a largely uneventful race today which was shortened after a yellow was triggered late in the race, but with the opposition – that we probably won’t be up against at future rounds – it isn’t a bad way to get the Championship underway. “The Hot Wheels™ Car Care Products Porsche has been the most popular car here again and we are just overwhelmed with the response we’ve had since rolling it out earlier this week – it’s been truly epic. “The car design by Brett Rogers Motorsport Design is yet another winner and I know he’s pretty proud of the way in which it has been prepared by Walkinshaw GT3.